The old town and its colorful pedestrian streets, crossed by the river Thiou draw a picturesque and enchanting framework. Its numerous food markets, creators, or its flea markets enliven the streets. Rich in cultural activities, from museums, castles and exhibitions, Annecy is rated the label "Art and History" so dear to the hearts of the inhabitants. Not to mention the pleasure of the senses with a traditional dish in one of the many restaurants Annecy. Not to mention its lake and its conducive to walk." As you will cross the French-Swiss border, the Passport is obligatory!!! Visa (if applicable). 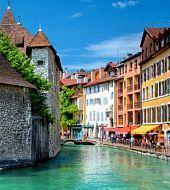 Itinerary: From Geneva to Annecy by bus, around 60 minutes.